The Irish Government has written to the Football Association of Ireland to demand further information on its financial dealings. The FAI has been asked to explain a 100,000 euro loan it received from its chief executive John Delaney in 2017. The Association say the transaction, first reported by the Sunday Times, was a bridging loan that was fully repaid. Sport Ireland, the state body tasked with the development of sport in the Republic, has requested more details. 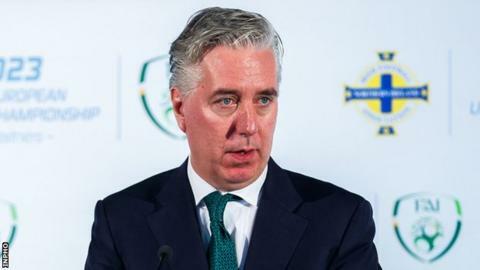 In response, the FAI said in a statement on Wednesday evening that it had "answered all queries" in relation to the request from Sport Ireland chief executive John Treacy, adding that it was "looking forward to his response". "The FAI are also willing to meet with [Irish Sports] Minister Ross and Sport Ireland to discuss these matters further," continued the statement. In a statement issued on Tuesday, Sport Ireland said it has contacted the FAI seeking urgent clarification on the circumstances of the loan, which was made in April 2017, and its repayment two months later. The statement added: "Sport Ireland was not notified at any stage in 2017 about any apparent material deterioration in the FAI's financial position, as per Sport Ireland's Terms and Conditions of Grant Approval, and has sought additional clarification in relation to this matter." Sport Ireland oversees the conduct of National Governing Bodies, including the FAI, and is responsible for the administration of state funding for sport. On Saturday, Delaney confirmed he had given his employers a bridging loan "to aid a very short-term cash flow issue". Delaney, who has served as chief executive for over 14 years, added: "This is the only occasion on which I provided the Association with a short-term loan." Separately, the Association says it has commissioned a full review of the its executive governance and senior management structures by an external consultant with the report and recommendations expected to be made public in early April.